EW-7811Un is a nano USB wireless adapter that supports maximum range and speed. 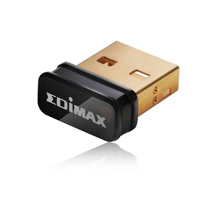 Despite the size, this tiny USB adapter supports higher data rate of up to 150Mbps when connecting with wireless 802.11n device which is 3 times faster than your normally 11g connection. You can just plug it into computer's USB port and enjoy incredible high-speed wireless network access. This is for sure the trendiest piece of upgrade you can make to your wireless network. EW-7811Un complies with wireless IEEE802.11b/g/n standards. As being built with the latest wireless technology, the EW-7811Un can increase your wireless coverage up to 3 times as much and greatly help reduce “dead spots” compared to your old 11g adapter. The transmission data rate can go up to 150Mbps when connected to a 802.11n device, with signal travel further and connection a lot more stable compared to your previous 802.11g network . EW-7811Un has adapted a clever protocol in smart transmission power control. The adapter smartly adjust transmission output by distance and CPU offload to help reduce power consumption when wireless is idle. With the green WLAN technology, the power consumption can be reduced up to 20% ~ 50%. The adapter does not just provide you with the best wireless technology in the world, it also care for the environment by using less energy and your pocket by saving up on your electric bills. Wi-Fi Protected Setup (WPS) is a standard for easy and secure establishment of a wireless network. This wireless USB adapter supports software WPS-compatible configuration. By pressing 2 buttons, your wireless network is immediately secured providing your wireless router will also support this great easy function. The included 16 languages EZmax setup wizard and friendly UI will walk you through configuring EW-7811Un to your wireless network. EW-7811Un is currently the smallest wireless adapter. The compact design of EW-7811Un is convenient to carry for all mobile users. It also means you will not be able to accidentally snap your USB adapter anymore as it is hidden very well once it is plugged into the USB port. Few months ago my laptop's wifi stopped working and when I took the laptop to a technician he quoted me $400 for the repair on the wifi. I asked the Elive.co.nz team and they suggested me this Nano Wireless USB Adapter. Now my wifi is working even faster & easy to use - most importantly this works on Apple Mac too. I also use it on my desktop. I dont need to shift the modem near to the desktop for internet, the desktop is on wifi too. Thanks Elive.